Due to its extremely strong construction, Bioflex Ultra has outstanding resistance to temperature and pressure, much higher than that of conventional convoluted PTFE lined hose. Bioflex Ultra GP or AS PB - MWPs for PB are as given in the table up to 80˚C, then reduced by 50% between 80˚C and 100˚C (the maximum for PB). Min temperature -30˚C. All sizes and grades of Bioflex Ultra hose are usable at vacuum to -0.9bar up to 200˚C (100˚C for TO grades). 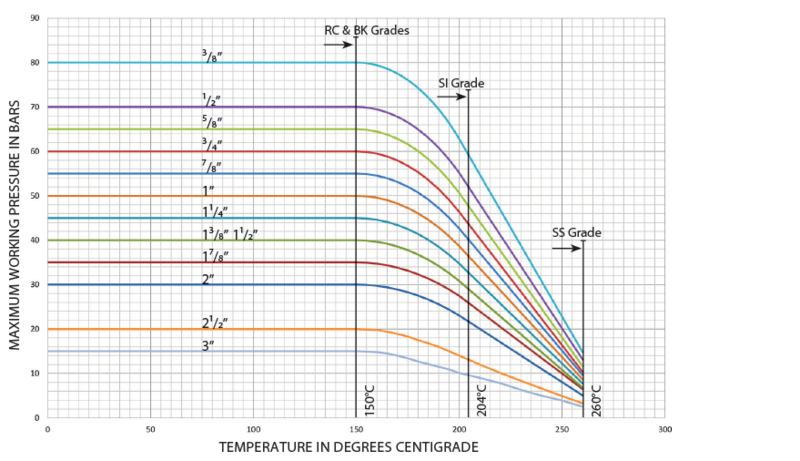 Above this, the vacuum resistance should be reduced 2% for every degree above 200˚C (100˚C for TO grades). In practice, flow rates will vary with hose flexing, fluid viscosity, end fitting design and other parameters, but Bioflex Ultra hose flow rates are always around 2 times better than convoluted PTFE hose, when comparing hose assemblies with PTFE lined (non bore-restricted) end fittings. If it is required to determine the flow rate of a particular hose assembly, or if it is required to determine the pressure required to generate a certain flow rate, then this can sometimes be approximately calculated by the Bioflex Ultra supplier. It should be noted that calculations can only be made for fluids with a viscosity equal to water, and for hose assemblies with PTFE lined end fittings (no bore restrictions at the ends of the hose). Pressure in Bars at the Entry into the Hose Assembly - subtracted from - Pressure in Bars at the Exit from the Hose Assembly (to calculate Pressure Drop over the Hose Length).